Condé Nast Traveler once again in 2018 includes Todd Smith, Founder and President of small ship cruise experts AdventureSmith Explorations, in its annual list of Top Travel Specialists. The magazine has singled out Smith for this highest professional recognition since 2012. Authorities like Smith, representing diverse travel arenas, are chosen based on their combination of specialized knowledge, first-hand travel experience, local connections, customer service and the value they bring to vacation planning. Every year the Condé Nast Traveler team evaluates hundreds of applicants. Each applicant undergoes a rigorous screening process that includes a detailed application with sample itineraries, client references and phone interviews. AdventureSmith Explorations’ travelers all benefit from this well-traveled staff that in 2018 alone conducted research in The Amazon, Australia, Alaska, Baja, Galapagos, Panama, Patagonia, the Polar Circle, Antarctica and Indonesia. Smith and his family spent a month this year on an Australia adventure that included a Great Barrier Reef Cruise. 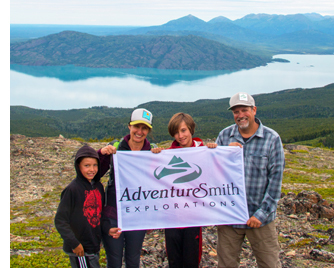 Family travel is an AdventureSmith Explorations’ hallmark, with Smith setting off with his wife and children whenever school breaks allow to gain experiences that are passed on to clients. “The AdventureSmith team itself is like family in that we treat each other with respect, learn from each other and take care of each other. So many companies are laser-focused only at the client level; we strive to ingrain the same type of relationship and respect we treat our clients with internally as well,” Smith underscores. Like a growing family, the team has doubled in the past five years. For details on all of AdventureSmith Explorations’ small ship cruises, itineraries, availability and for 2019 reservations, please call 866-575-2875 toll-free or visit the company website.